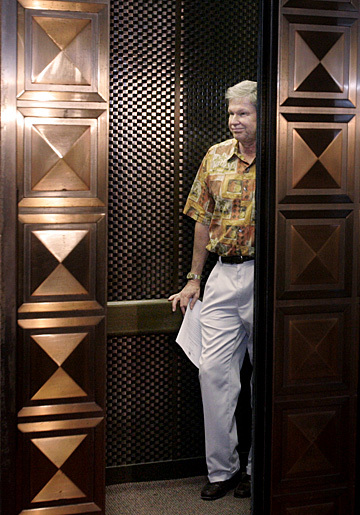 State Rep. Galen Fox was seen through closing elevator doors at the state Capitol yesterday after holding a news conference where he announced his resignation. State Rep. Galen Fox resigned from office yesterday after revealing that he was convicted of a sexual misconduct charge for touching a woman seated beside him on an airplane. Fox, 63, (R, Waikiki-Ala Moana) was convicted of sexual battery, a misdemeanor, in an Oct. 20 nonjury trial in U.S. District Court in Los Angeles. He was charged Dec. 18 after a 27-year-old woman accused him of putting his hand between her legs while she slept on the flight from Hawaii to Los Angeles, according to court documents obtained by KITV. "I vigorously fought the charges against me, which I hold to be untrue," Fox said yesterday in a brief news conference at the state Capitol. "I have been living with the consequences of my arrest for several months," Fox said. Long a Republican party leader, he relinquished his role as House minority leader in June, citing personal reasons. In his announcement, Fox said, "I believe the people of Waikiki, Ala Moana and Kakaako deserve to be represented by someone unclouded by a conviction such as the one I now carry. I continue to believe in the American system of justice." His resignation letter said his resignation will be effective Dec. 1. Fox said in an interview that he will be sentenced in January and that "the prosecutor did not ask for jail time." His announcement came less than an hour after a meeting with Gov. Linda Lingle and Lt. Gov. James "Duke" Aiona at which the governor told him, "I think it would be appropriate for you to resign, but it is your decision to make," said Russell Pang, media relations chief for the governor. Pang said the governor has known about the arrest "almost from the beginning." News about Fox's conviction and resignation shocked other Republicans and lawmakers. "I don't believe any of the (Republican) caucus knew about it," said Rep. Lynn Finnegan (R, Mapunapuna-Foster Village). She took over as House Republican leader after Fox asked for new leadership. "I was completely shocked when I heard about this the day before." House Speaker Calvin Say said, "I was stunned to hear the news about Rep. Galen Fox's resignation." In a written statement, Say said he did not know details of the case and would reserve comment until he had more information on this "troubling situation." Lingle praised Fox for being a "dedicated public servant" in a brief statement and said she was "saddened by this situation. By resigning today, he has done what is in the best interest of his constituents and the legislative process." Some neighborhood board members in Fox's district said they were shocked to hear of his decision to resign. They did not comment on the court case. "I'm terribly sorry to hear that," said Robert Finley, chairman of the Waikiki Neighborhood Board. "He's been loyal to the community and has taken positions to support the residents. He worked very hard for us." State Rep. Galen Fox, shown with House Republican leader Lynn Finnegan, announced his resignation yesterday at the state Capitol. John Breinich, chairman of the Ala Moana/Kakaako Neighborhood Board, said, "He has been an excellent representative of the people." "He has been responsive to all our community issues," he added. 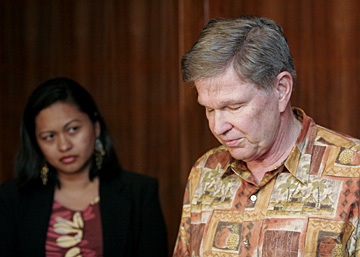 Sen. Fred Hemmings (R, Lanikai-Waimanalo), who has known Fox for more than 20 years, said he was saddened. "I can't understand it. It doesn't make sense. How can something like this happen when any rational person gets themselves involved in something like this?" Hemmings said. Hemmings noted that Fox's decision to resign was honorable. "I think we all as legislators have to adhere to a higher standard. We have the public's trust, therefore, we have to be trustworthy," he said. Last year, Rep. Brian Blundell (R, West Maui-North Kihei) was charged with fourth-degree assault for allegedly groping an undercover police officer outside a men's restroom at Kapiolani Park on July 15. Blundell lost his legislative seat in last year's election to Kameo Tanaka, brother of former state Sen. Joe Tanaka. Graduated: University of Hawaii Lab School, Punahou School, University of the Redlands, Bachelor of Arts degree; Princeton University, Ph.D.
Work: U.S. foreign service officer, Germany, Hong Kong, Taiwan and Washington, D.C., 1966-1982. Project director at the East-West Center, 1982-1984. Executive assistant to Mayor Frank Fasi, 1985-1991. State Business and Economic Development and Tourism administrator, 1991-1996.